Clare Devine. Devine by name, divine by nature, as exemplified on her blog KnitShareLove, a space that, Clare says, allows her ‘to share the things that inspire me, the makers that create things that make my heart skip a beat … a space to share the magical fibre things that fill my heart with creative inspired joy’. Clare now calls Melbourne home, after lives as a writer, designer and technical editor. Originally from South Africa, her incurable wanderlust has seen her knit her way around the UK, back to Western Cape and now, Australia. You may have encountered some of Clare’s designs for accessories on Ravelry, which have secured a worldwide fan base for her. Best of all, for the next little while, she is all ours! If you’ve been to the shop on Monday, you may just have met Clare. In KnitShareLove you’ve created such a warm, big-hearted community space. 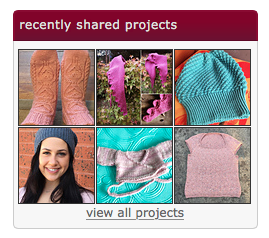 The site really speaks to knitters and people who love the craft and all that is associated with it. Beyond the patterns, you are so much about sharing skills. Tell us when the site began, your ambitions for it, and how it has evolved over the years. KnitShareLove evolved over a number of years, really. I first started knitting when we were travelling in Australia but I did not think about turning it into a business until I had my little girl. KnitShareLove was officially launched this year but the sentiment has always been at the heart of what I do. 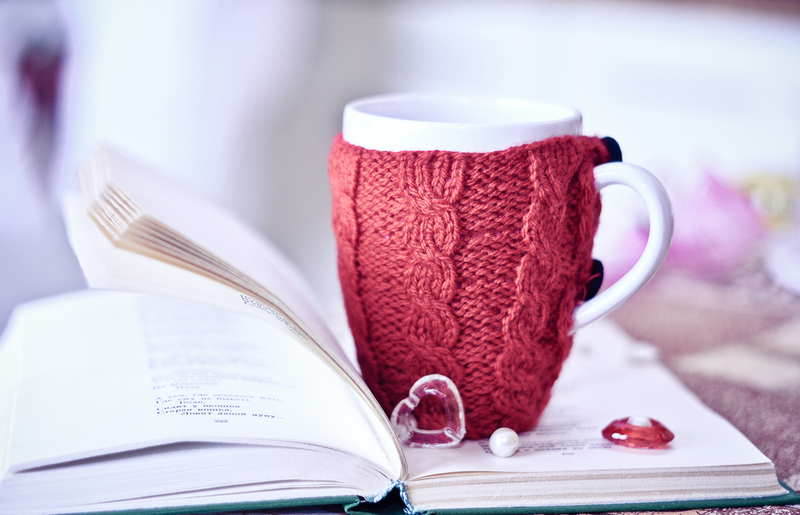 I love knitting and sharing my passion with other knitters, whether that is through my designs or sharing skills. KnitShareLove is a space to bring together all the things I love most about the knitting community. Did you become a designer from your other life as a technical editor? I guess I’m wondering, did one lead to the other? Those two lives sort of grew together hand in hand as I transitioned from working a full-time job in an entirely different field to working from home to look after my little one. I love working as an editor, it allows me to flex the grey matter and play with Excel … I have loved worked with many designers over the years from all over the place, and always enjoy getting to know them and their working style. You’ve lived the knitterly life in a few different countries now. Is there a difference in knitting/making culture in each of those places? And has the Net made access to these communities easier? I think there is always a difference between places – the climate, size of a place and access to yarns has a huge role to play in how people knit and how we interact. I loved living in Edinburgh and sometimes think I was spoilt by how awesome it was – the knitting scene there is really active and I had so much access to all sorts of wonderful yarn and fibre inspiration. That said, I’m really enjoying finding my way around the Aussie fibre scene. Nothing beats making new fibre friends and discovering new yarns. I am really interested in locally produced yarns so I’m currently on the hunt for interesting producers in Australia. There isn’t the same small-mill-style yarn creation happening here as in the UK, but I’m finding some stunning yarns and am always on the look-out for more. Let’s talk about your design life. Are you led by the yarn, or does the design come first, then it’s a matter of finding the right yarn to do it justice? Or is it a combination of all that and other intangibles? This really depends on the design. Sometimes I am led by an idea for a collection where I know what I want and I pick yarns to match; The Tea Collection was a little like this. Once I knew I wanted to create a series of Tea Hats I picked out yarns that balanced the collection and matched my design ideas for each tea. In other collections I’m very much driven by the yarn. Neighbourhood Sheep Society is very much like this. This is a really fun project I work on each year with Jess from Ginger Twist Studio in Edinburgh. We pick yarns that fascinate us, she works her colour magic and dyes them up, and I let them speak to me about what they want to be. I’m a firm believer in swatching and letting the yarn tell you what it wants to be – this always works better than trying to make yarn into something it is not suited for. Tell us about your ongoing romance with socks and hats. Why? 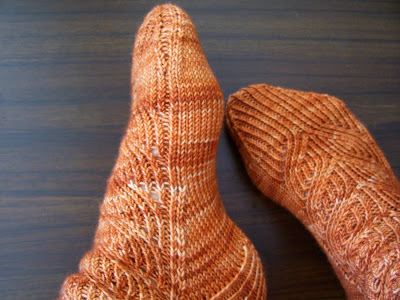 For ages I swore I wouldn’t knit socks – I just didn’t see the point! Then a switch flicked in my brain and I was madly in love with sock construction. I love that there are so many different ways to turn a heel or shape a toe. I’ve had lots of fun over the years designing socks. Socks also make perfect travel projects, so I always have a few on the needles ready to pick up as I dash out the door or set off on a big adventure. Hats – they were my break from socks! I started with Lapsang and then I found myself obsessed with the idea of Tea Hats and I took it from there. I love that you can get a hat from a single skein – I can pick up interesting yarns here and there and always have enough yarn for a great hat. I also detest having a cold head or feet, so hats and socks are must-have accessories in my wardrobe. What are the signature Clare Devine touches to your work? I think my signature would be incorporating tips and techniques into designs that elevate your knitting. I love teaching and am always trying to learn new things that I can use in my workshops to help knitters improve their knitting. I try to factor these things into my designs so you are always adding to your knitting repertoire. I recently started producing tutorials to accompany my patterns – they can be found here. Tell us about your design process, and how you know when you’ve got it with a piece of work. My design process isn’t as streamlined as I would like. I think that is partly the way my creative brain works, and partly because the last few years have been pretty chaotic with many house moves and lives spread across three continents. I have lots of ideas and notebooks full of sketches. Sometimes things take ages to click into place, but occasionally everything just falls into place pretty quickly. The process of taking an idea from concept through swatching to a final pattern is fairly long. There are lots of bits and pieces that need to be aligned to get to the final proofed pattern. Working with supportive technical editors and brilliant testers is always a joy and helps me fine-tune the final product. Not as much as I would like! Knitting isn’t the quickest activity and I almost always knit my own samples so most of my knitting time is taken up with sample knitting and design work. I do try to knit other patterns occasionally though. When I’m knitting another designer’s pattern I like to let my design brain switch off and just enjoy the process – I find it more relaxing that way. Which other designers, artists or creative people inspire you? This is a hard one – there are so many inspiring designers and creatives out there! One of my favourite knitwear designers is Bristol Ivy. I think she’s a genius when it comes to pushing the boundaries of construction and knitting technique. I love her aesthetic and style, and wish I could have endless knitting hours to work on knitting some of her amazing designs. Yarn and colour is a huge inspiration for my work, and I’ve enjoyed discovering local hand-dyers since I moved to Australia, including August Bird, Miss Click Clack, Circus Tonic Handmade, Gradient and, more recently, spotted at Bendigo, Owl of Athena. I also find lots of inspiring creatives on Instagram and have enjoyed discovering local artists and designers. At the moment I am fascinated by dyeing, fabric, quilting, exploring our new adopted home country and knitting. Some interesting accounts I have seen recently on Instagram include @Iamalchemy, @Arrowmountain, @Maxhosa, @Mazeandvale, @Rebeccadesnos, @Trinannelie, @Salt_and_still, @Seaskyeat, @Vic_pemberton and @Thefolkmaker. What can we look forward to in your trunk show at Sunspun? We have picked out a selection of hats, shawls and socks for the trunk show. I also have a few new patterns that will be debuting at Sunspun. Akin (pictured above, and Clare is wearing one too, at the start of the story) is an easy hat that is perfect for the whole family – it comes in seven sizes – and you can knit it in almost any yarn weight. Perfect for a quick winter warmer (certainly very much needed in Melbourne at the moment). I’m also releasing three socks that were previously only available in The Knitter, a UK magazine, so I’m very excited about showing those off. Most of all, I am looking forward to meeting local knitters and fibre folk! From 30 July, drop into Sunspun for Clare’s trunk show, where you can touch, feel and try on her wide selection of accessories. All of Clare’s patterns are available for purchase with a 10% discount (Sunspun members can add their usual discount) for the duration of the trunk show. On Saturday morning, Clare will be in the shop to say hi, answer questions, sign patterns and help you decide which beautiful yarns to choose for your next knit! On Tuesday 2 August from 6.15pm–9.15pm Clare will be teaching her Snell Cowl class, a slip-stitch colourwork project. Call us on (03) 9830 1609 to secure your spot. 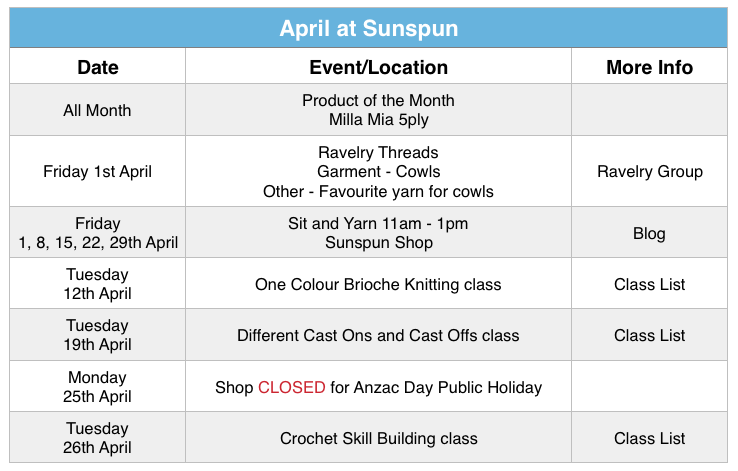 Categories: inspiration, Knitting, meet the maker, socks, Uncategorized | Tags: knitting, knitting classes Melbourne, knitting events, knitting Melbourne, Sunspun | Permalink. We’re Having a Trunk Show with Kirsten Johnstone! Have you heard of a Trunk Show before? No? Then read on! Yes? Then read on! A Trunk Show is a selection of knitted samples from yarn companies or designers that a shop can borrow for a short period of time to allow its customers to see what patterns or yarns will look like when they are knitted up. It is a special event that allows folk to come and see items that are not normally on display. As wonderful an asset to our knitting world as the internet has become, opening up the works of all designers to all knitters around the globe, nothing appeals like touching and feeling the garments and accessories that have so cleverly been created. And often a Trunk Show will include a visit by the designer to meet and chat to customers in the shop. And so, without out any further ado, let me introduce you to Kirsten Johnstone and give you the details of the forthcoming trunk show. Kirsten is a local Melbourne gal who has made a wonderful splash on the international knitting scene. She has designed for such influential companies as Brooklyn Tweed, Quince & Co, Woolfolk, Blue Sky Alpacas, amirisu and Shibui Knits. In her ‘other’ life (you know, when she is not knitting!) 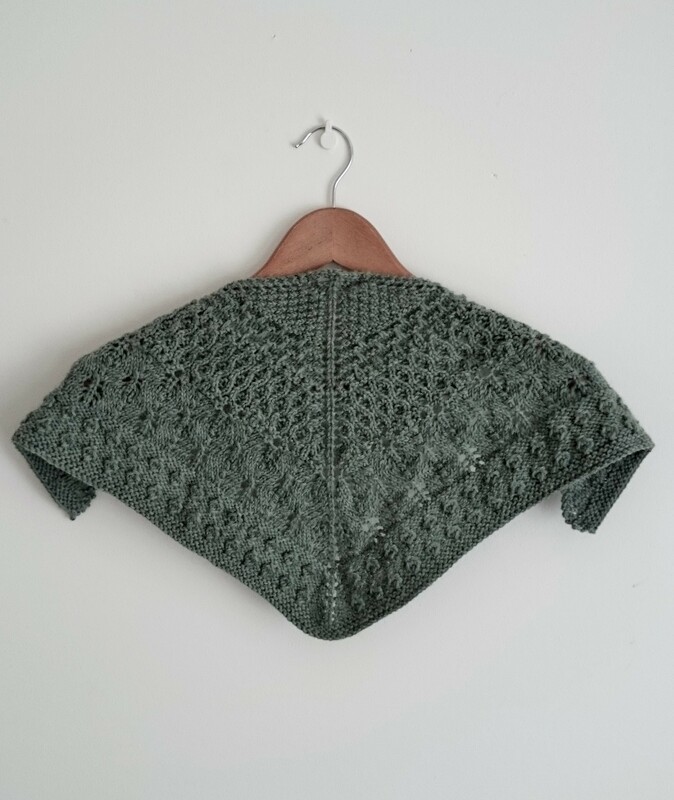 Kirsten is an architect and her love of clean lines and structure can be seen in her knitting designs. As she describes her garments “designs with a distinctive urban edge yet elegantly wearable”. We are thrilled to be able to share Kirsten’s designs with you over the span of a week or so in March. We will have a selection of 16 garments and accessories in the shop for you to touch, feel and try on! Additionally, Kirsten’s patterns will be available for purchase with a 5% discount (15% for Sunspun Members) for the duration of the trunk show. Annnnd ……. Kirsten will be in the shop on Saturday morning to say hi, answer questions and sign patterns! Kirsten has graciously agreed to teach a class for us as well! On Wednesday 9th March (6.15 – 9.15pm) we have scheduled her Sev[en]circles Neckpiece class. If you would like to book in now is the time as places are already filling. Just call us (9830 1609) and we can book you in and secure your spot. A special treat for Sunspun Members is a Meet, Greet and Nibbles night with Kirsten on Friday night. Oh …… and did I mention the Fashion Parade!!! For those of us who are ‘models’ – a very scary proposition!! Please make sure you RSVP by the required date (see your Invitation email) so we make sure to order sufficient nibbles. So, we hope that you will come along and touch and feel and try on and chat and enjoy the wonderful talent of Kirsten Johnstone – Aussie designer extraordinaire! Event details summarised below ! Categories: cardigans, Classes, events, inspiration, Knitting, New, Sunspun news, sweaters, Trunk Show | Tags: Brooklyn Tweed, knitting, knitting classes Melbourne, knitting events, knitting Melbourne, Shibui, Sunspun, Sunspun classes, Trunk Show | Permalink. ​Textured patterns have a long history in knitting; consider the intricate patterns of fisherman’s ganseys and aran jumpers or the delicate lace panels of a baby’s gown. Textures can prove effective in adding detail and interest into your finished pieces and enabling you to embellish and personalise your knitting and work well in both solid or multi-coloured yarns. Newer knitters can be perturbed and a little put off by some of the seemingly complicated methods of adding textures to their work, but this class is here to take you beyond basic stocking stitch and show you how to work textured stitches with confidence. 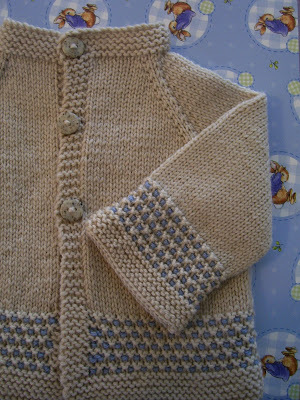 ​After all, texture is made with mostly just variations of knit and purl, isn’t it? This is a project-based class so you’ll take something home a finished (or almost!) object after the class. The class teacher, our own lovely Kylie, has designed a wee triangular kerchief called Trail Mix to introduce knitters to textured stitch patterns​; each section of this kerchief uses a different stitch pattern and introduces a new method for adding texture to knitting, such as slipped stitches, knit/purl combinations, cables, eyelets, lace and bobbles.​ As you work through the different sections, this kerchief will ​take you on a lovely meandering hike over mossy trails, paddock fences, an apiary and a pine forest, and finally finishing at a pebbly creek. During the class, we’ll also be discussing how to read from pattern charts, something that until people are often wary of until they experience how clear they really are. Charts are becoming increasingly prevelant in contemporary patterns and can make working complicated stitch patterns a little simpler. 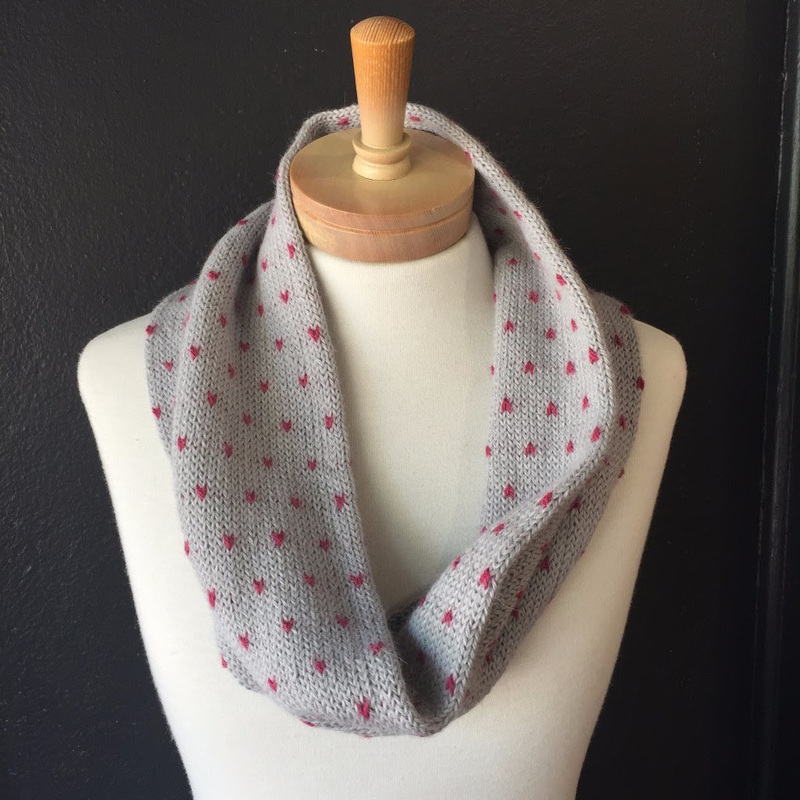 They also allow the designer to condense the physical size of their patterns, meaning they require less printing and are easier to travel with for the knitter on the go. We’ll be working from both charts and written instructions, to highlight the differences of both methods. So grab your materials (and maybe some hiking boots and a snack) and you’re ready to get started! This shawl was specifically designed for this class at Sunspun and each participant will receive a printed copy of the pattern, not available anywhere else until October 2014!​​ Please email or call the shop to book your place. Categories: Classes | Tags: knitting classes Melbourne, knitting Melbourne, Sunspun | Permalink.